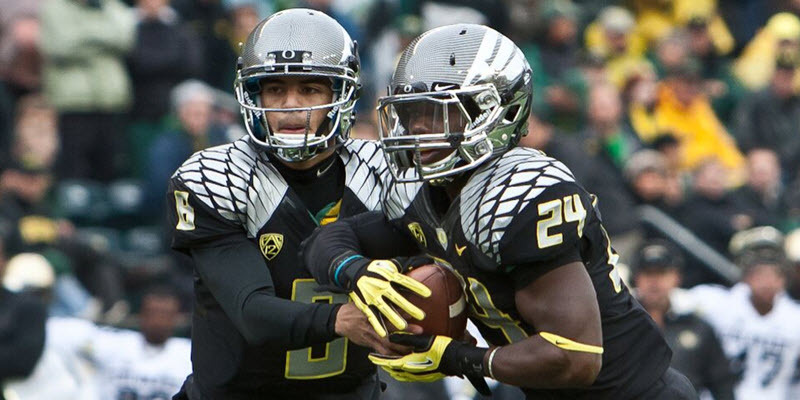 Marcus Mariota and Kenjon Barner. Oregon’s offense boils down to a series of constraint plays. One of those “counters” is the Mid-line, or Mid-Level read, where the QB reads an interior defender rather than a defensive end or linebacker. 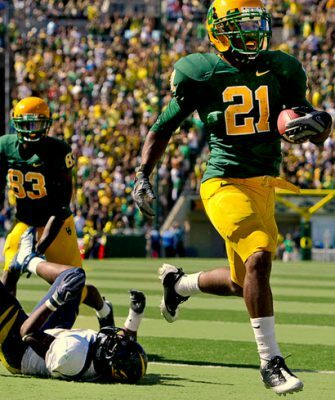 Examples from both the 2010 and 2011 seasons are included as FishDuck.com gives you an exclusive look at one of Oregon’s most dynamic running plays. —3. 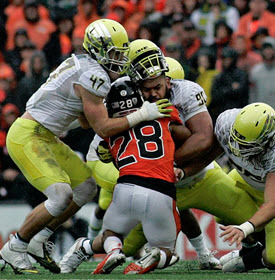 Past Play Reappears: Oregon’s Mid-Line Zone Read! 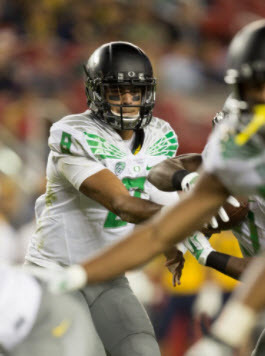 Marcus Mariota doing the mesh with Zone Reading. We will follow the conference rules for video usage while breaking down a very strange play from our game with Nicholls. We will also take a look at some new shining stars on offense that may have played under the radar of most observers. —5. The Fish Report: QB Runs Answered & A New Play! An analysis of how Oregon did Zone Reading of three different positions in a game against Arizona including the Mid-line or as some call the Mid-Level Zone Read play. We analyze two successful plays of the 2012 Rose Bowl Game, one of which has been viewed incorrectly by so many national analysts. We are fortunate at FishDuck.com to have a team who have built a progression of a knowledge base that makes understanding these plays easier. Chip fools us all again! This is THE definitive analysis for understanding the Bubble Zone Read-a key component of the Oregon Offense. For those who take the time to learn from this analysis, a massive number of questions will be answered in this keystone article. —10. Chip Kelly Slashes the Beavers Two Ways on One Play? First we zone read the OLB, and OSU stopped the play for a short gain. The next play we did an audible into zone reading the DE, and Mariota toasted him for a big gain. Later, to stop the audible, MM, and the cross-buck blocking action, we saw OSU overcompensate to one side, and this opened up the blocking on the other side. Nasty game-plan kinks! The Advanced Stage of Zone Reading is a level that few quarterbacks rise to, as it has become evident to me that Marcus Mariota has crossed that threshold, and entered into a new strata. He is now making Zone Reading decisions at the highest levels of which can only propel Oregon closer to another NC game. The second-level read is something that’s been slowly making its way into the mainstream of college football play-books around the country, and one of the biggest reasons is because the ability it gives offenses to play even more games with opponent linebackers. 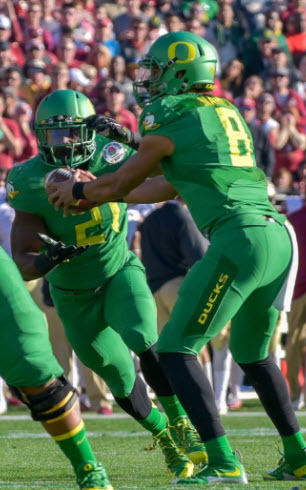 Royce Freeman and Marcus Mariota. 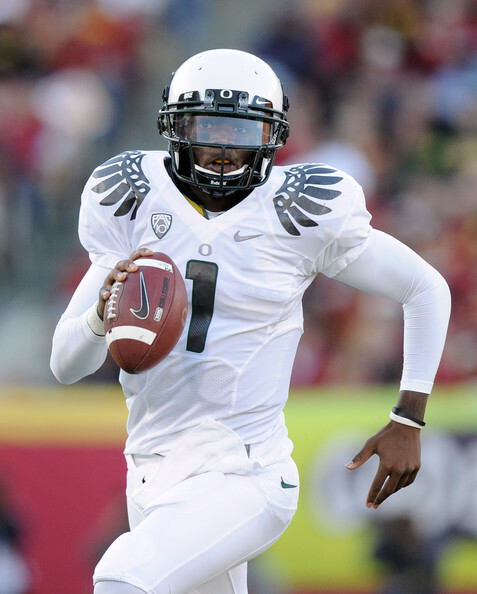 In a previous analysis I discussed Oregon’s Run-Pass Combo. In this follow-up analysis, I will look at how the Ducks use the same strategy to attack defenses by focusing on a single player. Now instead of reading a backside defender to dictate where the ball will go in the running game, Oregon is reading the play side OLB to dictate a packaged run-pass option. Wow! 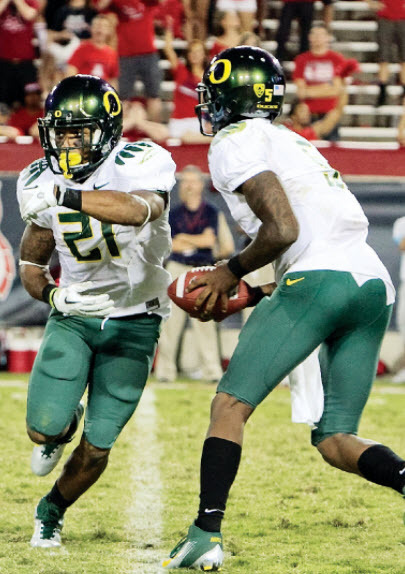 We have learned how so much of the Oregon Spread is predicated upon what the defense gives us, and how we “read” defenders on almost every play. This Pac-12 Championship game gave us numerous examples of that and could be epitome of a complete “READ” game from Oregon and Darron Thomas. Oregon breaks a tendency with the “Sweep Read” play, reveals a new profile at LB they are recruiting, and begins to Zone Read on the backside of which is different than before.